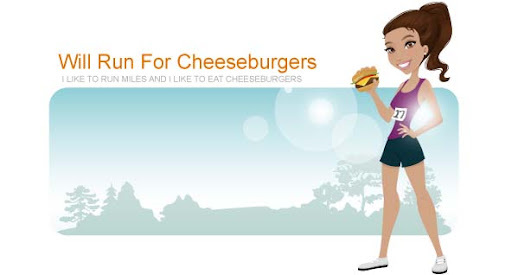 Will Run for Cheeseburgers: will run for a juicy lucy! will run for a juicy lucy! I realized since I've had this blog I haven't made any delicious cheeseburgers. Sure I've eaten quite a few, but I've neglected to make some burgers in the comfort of my own home. Ryan has been craving a burger for days now. It was actually getting to be quite irritating to hear him ask for a burger night after night instead of being content with the tasty meals I was preparing. On my walk home today I stopped by the grocery store and picked up some ingredients to make homemade burgers. I didn't want to make just any normal burger though ... I wanted something special, restaurant worthy. So I looked up a recipe for "Juicy Lucy" and here we go. 1. Mix together beef, Worcestershire sauce, garlic salt, and pepper in a large bowl. Form 4 thin patties from the beef mixture. Each patty should be slightly larger than a slice of cheese. 2. Cut each slice of cheese into 4 pieces; stack the pieces. Sandwich one stack of cheese between 2 ground beef patties. Tightly pinch edges together tightly seal the cheese within the meat. Repeat with the remaining cheese and patties. 3. Preheat a heavy bottomed skillet over medium heat. Cook burgers until well browned, about 4 minutes. It is common for burgers to puff up due to steam from the melting cheese. Turn burgers and prick the top of each to allow steam to escape; cook until browned on the outside and no longer pink on the inside; about 4 minutes. Serve on hamburger buns. ooey gooey cheese oozing out of the burger. success! closed due to inclement weather?? ?